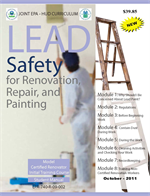 Painting Contractor College Pros was fined $7200.00 and agreed to perform 65,000 worth of work in Cambridge for failure to notify customers about lead hazards on 41 jobs. The violations were in Connecticut, Maine, Massachusetts and New Hampshire. Contractors ask; has EPA enforced Non RRP Certified Contractors? Yesterday in our NCHH RRP Training in Riverhead, New York a contractor asked; "will the EPA go after contractors who are not RRP Certified and Registered? Do you know of any illegal contractors who have been fined?